I wanted to switch from PyCharm to Visual Studio for my Python (more specific: arcpy) development, since we do a lot of developing in VS and I figured it would be nice to have a single development environment. I was pleasantly suprised that Python was available out-of-the-box after installing VS. But would it recognize my arcpy sitepackage (which was already present in my C:\Python27\ArcGISx6410.3 directory, since ArcGIS for Desktop is installed on my system). Guess what? No, it didn’t. But then I came across this blogpost. And it totally was applicable to my situation. So, if you think VS doesn’t understand arcpy, wait a few minutes after your first try… Thank you, Cindy Williams, for saving me a lot of frustration. Some more reading on arcpy in Visual Studio can be found here. If you or your organization don’t have access to ArcGIS Online (AGOL), but you still want to get your hands dirty with it, you have the possibility to sign up for an ArcGIS Developer account (here: https://developers.arcgis.com/en/sign-up/). You get access to all kinds of SDKs, you get 50 credits per month, but the best is: you get your very own ArcGIS Online organizational account. 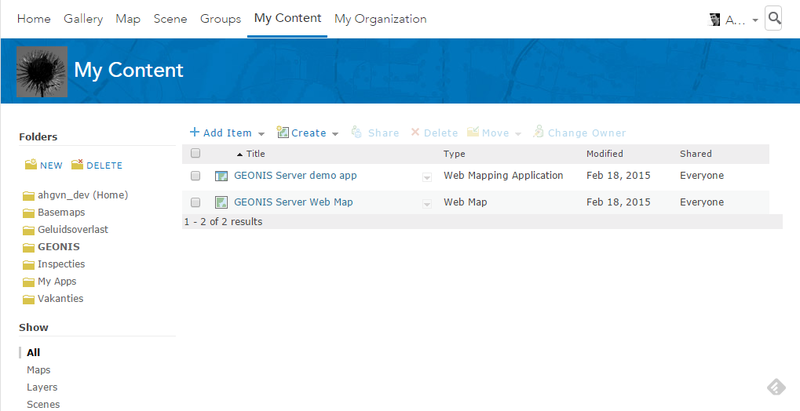 There is only one member of your organization (yes: you), but otherwise you’re able to use almost every feature of ArcGIS (for development purposes). As you might guess: my AGOL is located at ahgvn.maps.arcgis.com.